Disruptive innovations in technology have been one of the defining aspects of the short history of cinematic art. The introduction of sound in the 1920s, followed by color in the 1930s, followed much more recently by computer-generated imagery — all of which had profound creative implications — are the ones with which most movie fans are familiar. A lesser known but still important set of innovations occurred in the 1940s: faster film, improved microphones and lighter-weight cameras and equipment. Combine these enhanced technologies with a large number of cinematographers gaining experience in shooting under every conceivable condition during World War II, and you had the basis for a raft of films shot in realistic style on location. This week’s film recommendation is a high-quality example of the form, which explicitly packaged itself as such: Jules Dassin’s 1948 docu-drama The Naked City. 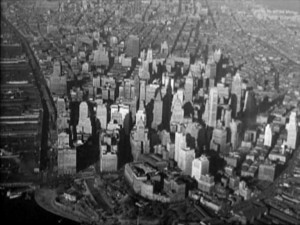 As the famous voice-over narration tell us as the film opens with a stunning airplane shot of Manhattan, The Naked City is not just a story of a murder investigation but of New York City and the people in it. The narration was provided by producer Mark Hellinger, a Runyonesque Big Apple journalist whose own colorful life could have been the basis for a fine biopic itself if he hadn’t sadly dropped dead shortly after the movie was finished. With New York and New Yorkers being the main characters, the film tells the story of the murder of a beautiful striver/gold digger and the efforts of the police to solve it. In addition to being distinctly its own film, The Naked City also fits into the then-emerging subgenre of crime investigation procedurals (Call Northside 777, The Street With No Name, and He Walked by Night were also released in 1948). The City that Never Sleeps, as seen through the Oscar-winning camerawork of William H. Daniels, has rarely been captured so vividly in film. Dozens of small performances, most of them I assume turned in by average NYCers rather than professional actors, add flavor throughout: The lady at the root beer stand, the guy hawking newspapers on a streetcorner, the funeral home director, the cop on the beat, the woman having her hair done and many others get their moment. Many of these little slices of life bear no relation to the murder mystery, but are instead intended to bring alive post-war Gotham. 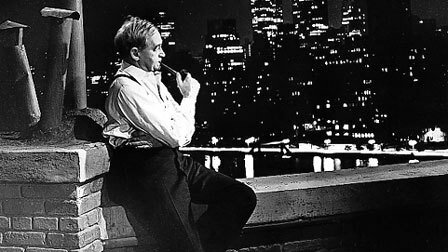 The murder mystery itself is actually a bit slow and convoluted, but it’s watchable because Barry Fitzgerald once again plays a twinkly-eyed charmer with a brogue. As Detective Lieutenant Muldoon, he has wonderful father-son style byplay with his eager-beaver protege and investigative leg man Jimmy Halloran (Don Taylor). The two of them help the film along during its slow spots, which most viewers will forget anyway because of the thrilling conclusion in which the police chase the killer on the Williamsburg bridge. One critical note on The Naked City. It is often referred to as a film noir, but I don’t think the noir elements are really here. Jimmy Halloran’s incredibly happy and loving suburban family is revealed underneath to be…an incredibly happy and loving suburban family. The cops are all honest and clearly differentiated from the very bad gang of criminals. Urban dwellers are generally portrayed without cynicism and the look of the film owes more to Italian Neorealism than noir. If you want a police docu-drama that is also a noir, see my recommendation of He Walked by Night. Final suggestion: The Naked City is so visually striking that if you seek it out, you owe it to yourself to watch the restored print available from the Criterion Collection.